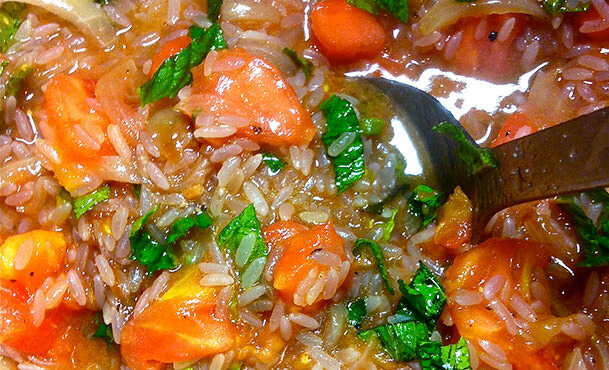 A Passion for summer…A passion for tomatoes….A passion for comfort food. 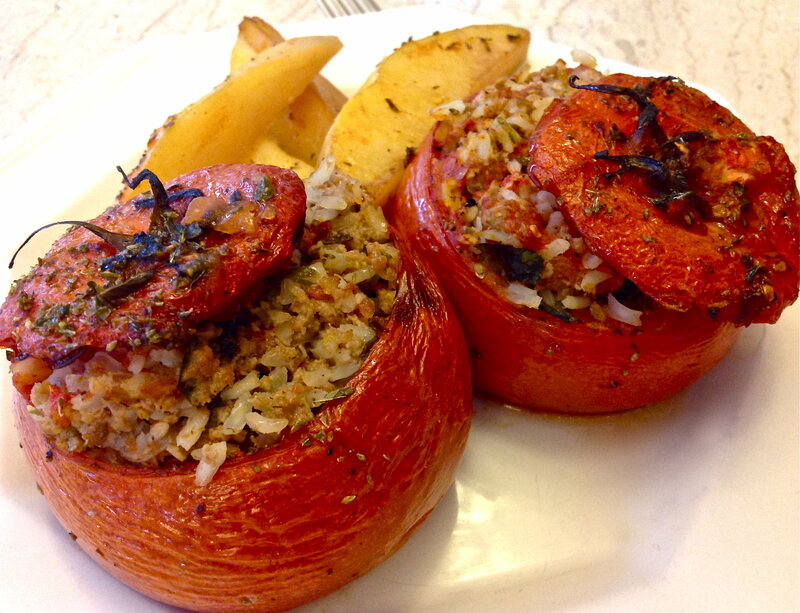 Stuffed tomatoes (gemista)…The ultimate summertime comfort food! 2. Wash tomatoes and cut a “cap” straight across the top. Carefully empty the inside using a spoon and save the chunks in a bowl. (Chop these chunks into smaller pieces) This is easier if the tomatoes are nicely ripened. 3. Wash green peppers and also slice off the top to use as a “cap”. Discard the seeds. 4. 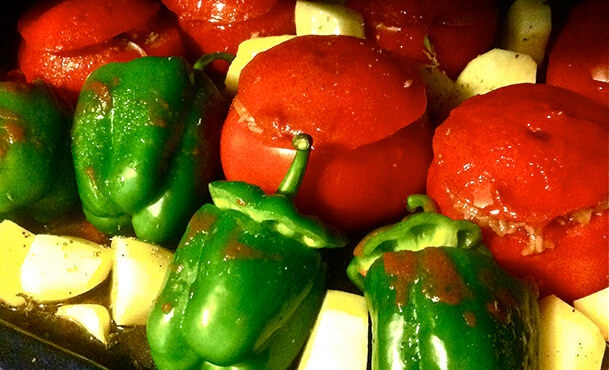 Arrange tomatoes and green peppers in a deep baking pan. 6. In a pot, heat 1/4 cup of the olive oil over medium heat. 7. Gently sauté the sliced onions, while stirring occasionally, until they become transparent. 8. Add the pine nuts and continue to sauté for another 2 minutes. 9. Add the raisins and rice, continue to sauté, stirring constantly so that the rice does not stick to the pot, for about another 1 minute. 10. Stir in the chopped tomato chunks, let that come to a boil and then remove from heat. 13. Preheat oven to 180°c/360°f. 14. Stuff the tomatoes and green peppers to 2/3 full. Do not pack in the rice. 15. Cover them with their “caps”. 16. Sprinkle the potatoes with salt and pepper and arrange them in the pan among the vegetables. 17. Bake in preheated oven for about 1 hour or until tops are crispy and potatoes are all gorgeous and goldenly delicious. 18. Really tasty when served about 30 minutes after removing from the oven and even tastier when served a couple of hours later. 19. Enjoy with a large chunk of feta cheese and an even larger green leafy lemony salad!